Our main objective is to decipher the molecular cross-talk that establishes between Mycobacterium tuberculosis (Mtb) and host immune cells during infection. We focus on understanding the role and the structure-function relationships of cell envelope lipids and glycoconjugates (such as glycolipids, lipoglycans, lipo- and manno-proteins) in the innate immune recognition of mycobacteria and the stimulation of CD1-restricted T cells. Modulation of innate immune responses. Mtb inhibits innate immune responses, including inflammation and autophagy, thus favoring its survival inside the infected host. Our goals are to uncover the molecular bases of Mtb recognition by pattern-recognition receptors, including TLRs and C-type lectins, and to identify Mtb factors that modulate macrophage function. Moreover, we wish to characterize Mt lipid trafficking within extracellular vesicles and the remodeling of Mtb lipidome during infection. Glycolipid antigen presentation to CD1-restricted T cells. Lipids and glycolipids are important antigens that induce CD1-restricted T cell-mediated specific immune responses. We intend to define the repertoire of Mtb lipid T cell epitopes, to characterize the molecular steps and mechanisms of their presentation by antigen-presenting cells and to evaluate of the protective efficacy of these antigenic lipids in animal models of Mtb infection. Structural and functional definitions of Mtb glycoproteome. We previously evidenced that protein-O-mannosylation is crucial for virulence of Mtb. Our aims are to identify and decipher the roles of the mannoproteins contributing to Mtb persistence, in vivo, and to understand the structure/function relationships of protein-O-mannosyl transferase in order to guide inhibition strategies. Our team is involved in international projects and consortia funded by the European Union, the National Institute of Health (USA) or the Bill & Melinda Gates Foundation. It was accredited the “Équipe FRM” label by the Fondation pour la Recherche Médicale in 2018. Blanc L et al. (2017) Mycobacterium tuberculosis inhibits human innate immune responses via the production of TLR2 antagonist glycolipids. Proc Natl Acad Sci U S A, Published ahead of print October 2, 2017 doi:10.1073/pnas.1707840114. Gilleron M et al. (2016) Lysosomal lipases PLRP2 and LPLA2 process mycobacterial multiacylated lipid antigens and generate T cell stimulatory antigens. Cell Chem Biol 23: 1147-56. Mannodendrimers prevent acute lung inflammation by inhibiting neutrophil recruitment. 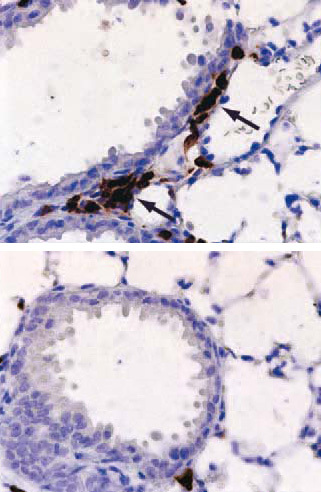 Lung sections of mice submitted to a LPS challenge and treated (down) or not (up; neutrophils stained in black are indicated by an arrow) with mannodendrimers. Souriant S, Balboa L, Dupont M, Pingris K, Kviatcovsky D, Cougoule C, Lastrucci C, Bah A, Gasser R, Poincloux R, Raynaud-Messina B, Al Saati T, Inwentarz S, Poggi S, Moran EJ, Gonzalez-Montaner P, Corti M, Lagane B, Vergne I, Allers C, Kaushal D, Kuroda MJ, del Carmen Sasiain M, Neyrolles O, Maridonneau-Parini I, Lugo-Villarino G, Vérollet C (2019) Tuberculosis exacerbates HIV-1 infection through IL-10/STAT3-dependent tunneling nanotube formation in macrophages. Cell Rep 26:P3586. Shahine A, Reinink P, Reijneveld JF, Gras S, Holzheimer M, Cheng TY, Minnaard AJ, Altman JD, Lenz S, Prandi J, Kubler-Kielb J, Moody DB, Rossjohn J & Van Rhijn I (2019) A T-cell receptor escape channel allows broad T-cell response to CD1b and membrane phospholipids. Nat Commun 10:56. Decout, A., Silva-Gomes, S., Drocourt, D., Blattes, E., Rivière, M., Prandi, J., Larrouy-Maumus, G., Caminade, A.-M., Hamasur, B., Källenius, G., Kaur, D., Dobos, K.M., Lucas, M., Sutcliffe, I.C., Besra, G.S., Appelmelk, B.J., Gilleron, M., Jackson, M., Vercellone, A., Tiraby, G. & Nigou J. (2018) Deciphering the molecular basis of mycobacteria and lipoglycan recognition by the C-type lectin Dectin-2. Sci Rep, 8, 16840. Nigou, J., Prandi, J., Blattes, E., Silva-Gomes, S., Caminade, A.-M., Vercellone, A. & Puzo, G. (2018) Rational design of mannodendrimers targeting human C-type lectin receptors to prevent lung inflammation. In Phosphorus dendrimers in biology and medicine: syntheses, characterization, and properties (Caminade, A.-M., Majoral, J.-P. & Turrin, C.-O., eds), pp 265-85, Pan Stanford Publishing Pte. Ltd., Singapore. James C.A., Yu K.K.Q., Gilleron M., Prandi J., Yedulla V.R., Moleda Z.Z., Diamanti E., Khan M., Aggarwal V.K., Reijneveld J.F., Reinink P., Lenz S., Emerson R.O., Scriba T.J., Souter M.N.T., Godfrey D.I., Pellicci D.G., Moody D.B., Minnaard A.J., Seshadri C., Van Rhijn I. (2018) CD1b Tetramers Identify T Cells that Recognize Natural and Synthetic Diacylated Sulfoglycolipids from Mycobacterium tuberculosis. Cell Chem Biol. 2018 Jan 29. pii: S2451-9456(18)30006-0. doi: 10.1016/j.chembiol.2018.01.006. Oldenburg R., Mayau V., Prandi J., Arbues A., Astarie-Dequeker C., Guilhot C., Werts C., Winter N., Demangel C. (2018) Mycobacterial Phenolic Glycolipids Selectively Disable TRIF-Dependent TLR4 Signaling in Macrophages. Front Immunol. 2018 Jan 19;9:2. doi: 10.3389/fimmu.2018.00002. eCollection 2018. Kaufmann SHE, Dockrell HM, Drager N, Ho MM, McShane H, Neyrolles O, Ottenhoff THM, Patel B, Roordink D, Spertini F, Stenger S, Thole J, Verreck FAW, Williams A; TBVAC2020 Consortium. (2017) TBVAC2020: Advancing Tuberculosis Vaccines from Discovery to Clinical Development. Front Immunol. 8:1203. Bah A, Vergne I. (2017) Macrophage Autophagy and Bacterial Infections. Front Immunol 8:1483. Robert, C.B., Thomson, M., Vercellone, A., Gardner, F., Ernst, R.K., Larrouy-Maumus, G. & Nigou, J. (2017) Mass spectrometry analysis of intact Francisella bacteria identifies lipid A structure remodeling in response to acidic pH stress. Biochimie 141, 16-20. Nigou, J., Touqui, L. & Record, M. (2017) Microbe and host lipids. Biochimie 141, 1-2. Vergne I., Lafont F., Espert L.,Esclatine A., Biard-Piechaczyk M. (2017) Autophagy, ATG proteins and infectious diseases.Médecine/Sciences. 33:312-318. Special Issue on "Autophagie", editorial: Patrice Codogno et Guido Kroemer. Decout A., Silva-Gomes S., Drocourt D., Barbe S., André I., Cueto F.J., Lioux T., Sancho D., Pérouzel E., Vercellone A., Prandi J., Gilleron M., Tiraby G. & Nigou J. (2017) Rational design of adjuvants targeting the C-type lectin Mincle. Proc Natl Acad Sci U S A 114:2675-2680. Larrouy-Maumus, G., Layre, E., Clark, S., Prandi, J., Rayner, E., Lepore, M., De Libero, G., Williams, A., Puzo, G. & Gilleron, M. (2017) Protective efficacy of a lipid antigen vaccine in a guinea pig model of tuberculosis. Vaccine 35:1395-1402. Parra, J., Marcoux, J., Poncin, I., Canaan, S., Hermann, J.-L., Nigou, J., Burlet-Schiltz, O. & Rivière, M. (2017) Scrutiny of Mycobacterium tuberculosis 19 kDa antigen proteoforms provides new insights in the lipoglycoprotein biogenesis paradigm. Sci Rep 7:43682. Angala, S.K., McNeil, M.R., Shi, L., Joe, M., Pham, H., Zuberogoitia, S., Nigou, J., Boot, C.M., Lowary, T.L., Gilleron, M. & Jackson, M. (2017) Biosynthesis of the methylthioxylose capping motif of lipoarabinomannan in Mycobacterium tuberculosis. ACS Chem Biol 12:682-691. Troegeler, A., Mercier, I., Cougoule, C., Colom, A., Duval, C., Vu Manh, T.-P., Capilla, F., Poincloux, R., Pingris, K., Nigou, J., Rademann, J., Dalod, M., Verreck, F.A.W., Al Saati, T., Lugo-Villarino, G., Lepenies, B., Hudrisier, D. & Neyrolles, O. (2017) C-type lectin receptor DCIR modulates immunity to tuberculosis by sustaining type I interferon signaling in dendritic cells. Proc Natl Acad Sci USA 114:E540-E549. Jankute, M., Alderwick, L.J., Noack, S., Veerapen, N., Nigou, J. & Besra, G.S. (2017) Disruption of Mycobacterial AftB Results in Complete Loss of Terminal β(1 → 2) Arabinofuranose Residues of Lipoarabinomannan. ACS Chem Biol 12:183-190. Deboosère, N., Iantomasi, R., Queval, C.J., Song, O.R., Deloison, G., Jouny, S., Debrie, A.S., Chamaillard, M., Nigou, J., Cohen-Gonsaud, M., Locht, C., Brodin, P. & Veyron-Churlet, R. (2017) LppM impact on the colonization of macrophages by Mycobacterium tuberculosis. Cell Microbiol 19:e12619. Roux, A.L., Viljoen, A., Bah, A., Simeone, R., Bernut, A., Laencina, L., Deramaudt, T., Rottman, M., Gaillard, J.L., Majlessi, L., Brosch, R., Girard-Misguich, F., Vergne, I., de Chastellier, C., Kremer, L. & Herrmann, J.L. (2016) The distinct fate of smooth and rough Mycobacterium abscessus variants inside macrophages. Open Biol 6:160185. Gilleron, M., Lepore, M., Layre, E., Cala-De Paepe, D., Mebarek, N., Shayman, J.A., Canaan, S., Mori, L., Carrière, F., Puzo, G. & De Libero, G. (2016) Lysosomal lipases PLRP2 and LPLA2 process mycobacterial multiacylated lipid antigens and generate T cell stimulatory antigens. Cell Chem Biol 23:1147-56. Arbues, A., Malaga, W., Constant, P., Guilhot, C., Prandi, J. & Astarie-Dequeker, C. (2016) Trisaccharides of Phenolic Glycolipids Confer Advantages to Pathogenic Mycobacteria through Manipulation of Host-Cell Pattern-Recognition Receptors. ACS Chem Biol 11:2865-75. Barthe, P., Veyron-Churlet, R., de Visch, A., Gilleron, M., Saliou, J.-M., Tomavo, S., Nigou, J., Brodin, P. & Cohen-Gonsaud, M. (2016) Mycobacterium tuberculosis LppM displays an original structure and domain composition linked to a dual localisation. Structure 24:1788-1794. Bah, A., Lacarriere, C. & Vergne, I. (2016) Autophagy-related proteins target ubiquitin-free mycobacterial compartment to promote killing in macrophages. Front Cell Infect Microbiol 6:53. Kaufmann, E., Spohr, C., Battenfeld, De Paepe, D., Holzhauser, Balks, E., Homolka, S., Reiling, N., Gilleron, M., Bastian, M. (2016) BCG-vaccination induces robust CD4+ T-cell responses to Mycobacterium tuberculosis complex-specific lipopeptides in guinea pigs. J Immunol 196(6):2723-32. Camacho F., Sarmiento M.E., Reyes F., Kim L., Huggett J., Lepore M., Otero O., Gilleron M., Puzo G., Norazmi M. N., Rook G., Mori L., De Libero G. & Acosta A. (2016) Selection of phage-displayed human antibody fragments specific for CD1b presenting the Mycobacterium tuberculosis glycolipid Ac2SGL. Int. J. Mycobacteriol. 5:120-7. Vétizou, M., Pitt, J.M., Daillère, R., Lepage, P., Waldschmitt, N., Flament, C., Rusakiewicz, S., Routy, B., Roberti, M.P., Duong, C.P.M., Poirier-Colame, V., Roux, A., Becharef, S., Formenti, S., Golden, E., Cording, S., Eberl, G., Schlitzer, A., Ginhoux, F., Mani, S., Yamazaki, T., Jacquelot, N., Enot, D.P., Bérard, M., Nigou, J., Opolon, P., Eggermont, A., Woerther, P.L., Chachaty, E., Chaput, N., Robert, C., Mateus, C., Kroemer, G., Raoult, D., Gomperts Boneca, I., Carbonnel, F., Chamaillard, M. & Zitvogel, L. (2015) Anticancer immunotherapy by CTLA4 blockade relies on the gut microbiota. Science 350(6264):1079-84. Seshadri C., Lin L., Scriba T.J., Peterson G., Freidrich D., Frahm N., DeRosa S.C., Moody D.B., Prandi J., Gilleron M., Mahomed H., Jiang W., Finak G., Hanekom W.A., Gottardo R., McElrath M.J., Hawn T.R. (2015) T Cell Responses against Mycobacterial Lipids and Proteins Are Poorly Correlated in South African Adolescents. J Immunol 195(10):4595-603. Prakhar P., Holla S., Ghorpade D.S., Gilleron M., Puzo G., Udupa V., Balaji K.N. (2015) Ac2PIM-responsive miR-150 and miR-143 Target Receptor-interacting Protein Kinase 2 and Transforming Growth Factor Beta-activated Kinase 1 to Suppress NOD2-induced Immunomodulators. J Biol Chem, 290(44):26576-86. Larrouy-Maumus, G., Gilleron, M., Skovierová, H., Zuberogoitia, S., Brennan, P.J., Puzo, G., Jackson, M. & Nigou, J. (2015) A glycomic approach reveals a new mycobacterial polysaccharide. Glycobiology 25(11):1163-71. Troegeler, A., Lugo-Villarino, G., Hansen, S, Rasolofo, V, Henriksen, M.L., Mori, K., Ohtani, K., Duval., C, Mercier., I, Bénard., A, Nigou, J., Hudrisier, D., Wakamiya, N. & Neyrolles, O. (2015) Collectin CL-LK Is a Novel Soluble Pattern Recognition Receptor for Mycobacterium tuberculosis. PLoS One 10(7), e0132692. Wheat, W.H., Dhouib, R., Angala, S.K., Larrouy-Maumus, G., Dobos, K., Nigou, J., Spencer, J.S. & Jackson, M. (2015) The Presence of a Galactosamine Substituent on the Arabinogalactan of Mycobacterium tuberculosis Abrogates Full Maturation of Human Peripheral Blood Monocyte-Derived Dendritic cells and Increases Secretion of IL-10. Tuberculosis 95(4), 476-89. Espert, L., Beaumelle, B. & Vergne, I. (2015) Autophagy in Mycobacterium tuberculosis and HIV infections. Front Cell Infect Microbiol 5:49. Wang, J., Gasc, F. & Prandi, J. (2015) Samarium Diiodide Mediated Coupling of 2-Pyridylsulfonyl Furanosides with Aldehydes and Ketones: A General Synthesis of C-Furanosides. Eur J Org Chem 12, 2691–2697. Vergne, I., Gilleron, M. & Nigou, J. (2015) Manipulation of the endocytic pathway and phagocyte functions by Mycobacterium tuberculosis lipoarabinomannan. Front Cell Infect Microbiol 4, 187. Lanéelle, M.-A., Nigou, J. & Daffé, M. (2015) Lipid and lipoarabinomannan purification and characterization. Methods Mol Biol 1285, 77-103. Blattes, E., Vercellone, A., Gomes-Silva, S., Prandi, J. & Nigou, J. (2015) Molecular bases of Mycobacterium tuberculosis recognition by the C-type lectin DC-SIGN: from the modulation of innate immune response to the design of innovative anti-inflammatory drugs. In Carbohydrates in Drug Design and Discovery (Jimenez-Barbero, J., Javier Canada, F. & Martin-Santamaria, S., eds), pp 64-88, The Royal Society of Chemistry, Cambridge, UK. Larrouy-Maumus, G. & Puzo, G. (2015) Mycobacterial envelope lipids fingerprint from direct MALDI-TOF MS analysis of intact bacilli. Tuberculosis 95:75-85. Gomes-Silva, S., Decout, A. & Nigou, J. (2014) Pathogen-Associated Molecular Patterns (PAMPs). In Encyclopedia of Inflammatory Diseases (Parnham BSc, PhD, CBiol MSB, FBPharmacolS M., Ed). SpringerReference (www.springerreference.com). Springer Basel. DOI 10.1007/978-3-0348-0620-6_35-1. Blanc, L., Castanier, R., Mishra, A.K., Ray, A., Besra, G.S., Sutcliffe, I., Vercellone, A., & Nigou, J. (2013) Gram-positive bacterial lipoglycans based on a glycosylated diacylglycerol lipid anchor are microbe-associated molecular patterns recognized by TLR2. PLoS One 8:e81593. Gau, B., Lemétais, A., Lepore, M., Garcia-Alles, L.-F., Bourdreux, Y., Mori, L., Gilleron, M., De Libero, G., Puzo, G., Beau, J.-M. & Prandi, J. (2013) Simplified Deoxypropionate Acyl Chains for Mycobacterium tuberculosis Sulfoglycolipid Analogues: Chain Length is Essential for High Antigenicity. ChemBioChem 14:2413-7. Liu, C.-F., Drocourt, D., Puzo, G., Wang, J.-Y. & Rivière, M. (2013) Innate immune response of alveolar macrophage to house dust mite allergen is mediated through TLR2/-4 co-activation. PLoS One 8:e75983. Blattes, E., Vercellone, A., Eutamène, H., Turrin, C.O., Théodorou, V., Majoral, J.P., Caminade, A.M., Prandi, J., Nigou, J. & Puzo, G. (2013) Mannodendrimers prevent acute lung inflammation by inhibiting neutrophil recruitment. Proc Natl Acad Sci USA 110:8795-800. Liu, C.F., Tonini, L., Malaga, W., Beau, M., Stella, A., Bouyssié, D., Jackson, M., Nigou, J., Puzo, G., Guilhot, C., Burlet-Schiltz, O. & Rivière, M. (2013) Bacterial protein-O-mannosylating enzyme is crucial for virulence of Mycobacterium tuberculosis. Proc Natl Acad Sci USA 110: 6560-5. Gouzy, A., Nigou, J., Gilleron, M., Neyrolles, O., Tailleux, L. & Gordon, S.V. (2013) Tuberculosis 2012: Biology, pathogenesis and intervention strategies-an update from the City of Light. Res Microbiol 164: 270-80. Afonso-Barroso, A., Clark, S.O., Williams, A., Rosa, G.T., Nóbrega, C., Silva-Gomes, S., Vale-Costa, S., Ummels, R., Stoker, N., Movahedzadeh, F., van der Ley, P., Sloots, A., Cot, M., Appelmelk, B.J., Puzo, G., Nigou, J., Geurtsen, J. & Appelberg, R. (2013) Lipoarabinomannan mannose caps do not affect mycobacterial virulence or the induction of protective immunity in experimental animal models of infection and have minimal impact on in vitro inflammatory responses. Cell Microbiol 15: 660-74. Geerdink, D., ter Horst, B., Lepore, M. Mori, L., Puzo, G., Hirsch, A., Gilleron, M., de Libero, G.& Minnaard, A. (2013) Total synthesis, stereochemical elucidation and biological evaluation of Ac2SGL; a 1,3-methyl branched sulfoglycolipid from Mycobacterium tuberculosis. Chem Sci 4: 709–716. Ray A., Cot M., Puzo G., Gilleron M., Nigou J. (2013) Bacterial cell wall macroamphiphiles: Pathogen-/microbe-associated molecular patterns detected by mammalian innate immune system. Biochimie 95: 33-42. Mishra, A.K., Alves, J.E., Krumbach, K., Nigou, J., Castro, A.G., Geurtsen, J., Eggeling, L., Saraiva, M. & Besra G.S. (2012) Differential arabinan capping of lipoarabinomannan modulates innate immune responses and impacts T helper cell differentiation. J Biol Chem 287:44173-83. Larrouy-Maumus, G., Škovierová, H., Dhouib, R., Angala, S.K., Zuberogoitia, S., Pham, H., Drumond Villela, A., Mikušová, K., Noguera, A., Gilleron, M., Valentínová, L., Korduláková, J., Brennan, P.J., Puzo, G., Nigou, J. & Jackson M. (2012) A small multidrug resistance-like transporter involved in the arabinosylation of arabinogalactan and lipoarabinomannan in mycobacteria. J Biol Chem 287: 39933-41. Cala-De Paepe D., Layre E., Giacometti G., Garcia-Alles L.F., Mori L., Hanau D., De Libero G., de la Salle H., Puzo G., Gilleron M. (2012) Deciphering the role of CD1e in mycobacterial phosphatidyl-myo-inositol-mannosides (PIM) processing for presentation by CD1b to T lymphocytes. J Biol Chem 287:31494-502. Prandi, J., A Convenient Synthesis of Glucose Monomycolate. Carbohydr Res 2012, 347:151–154. Krishna, S., Ray, A., Dubey, S.K., et al., Lipoglycans contribute to innate immune detection of mycobacteria. PLoS One, 2011, 6(12):e28476. Cot, M., et al., Lipoteichoic acid in Streptomyces hygroscopicus: Structural model and immunomodulatory activities. PLoS One 2011, 6(10):e26316. Garcia-Alles, L.F., et al., Structural reorganization of the antigen-binding groove of human CD1b for presentation of mycobacterial sulfoglycolipids. Proc Natl Acad Sci USA, 2011, 108(43):17755-60. Facciotti, F., Fine tuning by human CD1e of lipid-specific immune responses. Proc Natl Acad Sci USA 2011, 108(34):14228-33. Garcia-Alles, L.F., et al., Crystal structure of human CD1e reveals a groove suited for lipid-exchange processes. Proc Natl Acad Sci USA 2011, 108(32):13230-5. Layre, E., et al., Deciphering sulfoglycolipids of Mycobacterium tuberculosis. J Lipid Res 2011. 52(6): p.1098-1110. Baud C., et al., Membrane-associated DegP in Bordetella chaperones a repeat-rich secretory protein. Mol Microbiol 2011, 80(6):1625-36. Mishra, A.K., et al., Lipoarabinomannan biosynthesis in Corynebacterineae: the interplay of two α(1→2)-mannopyranosyltransferases MptC and MptD in mannan branching. Mol Microbiol 2011. 80(5): p.1241-1259. Roux, A.L., et al., Overexpression of proinflammatory TLR-2-signalling lipoproteins in hypervirulent mycobacterial variants. Cell Microbiol 2011, 13(5): p.692–704. Birch, H.L., et al., A truncated lipoglycan from mycobacteria with altered immunological properties. Proc Natl Acad Sci U S A, 2010. 107(6): p. 2634-9. Astarie-Decqueker, et al., The role of mycobacterial lipids in host pathogenesis. Drug Discov Today (Disease Mechanisms), 2010. 7(1): p.e33-41. Puzo, G., Lipidomique. Médecine Clinique, 2010. 46: p.30-35. Rivière, M., Les défis de la glycomique clinique. Médecine Clinique, 2010. 47: p.22-26. Brodin, P., et al., High content phenotypic cell-based visual screen identifies Mycobacterium tuberculosis acyltrehalose-containing glycolipids involved in phagosome remodeling. PLoS Pathog, 2010. 6(9): e1001100. Driessen, N.N., et al., Mycobacterium marinum MMAR_2380, a predicted transmembrane acyltransferase, is essential for the presence of the mannose cap on lipoarabinomannan. Microbiology, 2010. 156(Pt 11): p. 3492-502. Jang, J., et al., Functional characterization of the Mycobacterium tuberculosis serine/threonine kinase PknJ. Microbiology, 2010. 156(Pt 6): p. 1619-31. Liu, C.F., et al., Surfactant protein D inhibits mite-induced alveolar macrophage and dendritic cell activations through TLR signalling and DC-SIGN expression. Clin Exp Allergy, 2010. 40(1): p. 111-22. Skovierova, H., et al., Biosynthetic origin of the galactosamine substituent of Arabinogalactan in Mycobacterium tuberculosis. J Biol Chem, 2010. 285(53): p. 41348-55. Dendrimères à terminaison saccharide à visée anti-inflammatoire. Blattes, E., Puzo, G., Prandi, J., Nigou, J., Vercellone, A., Majoral, J.P., Turrin, C.O., Caminade A.M.
Patent n° 10 56902 (FR, 31/08/2010), 11764827.9 (EU, 31/08/2011), 13/819872 (USA, 31/08/2011). Pharmaceutical compositions comprising actinomycete glycerol acyl derivatives antigens, their process of extraction, and their use against tuberculosis. Puzo, G., Layre, E., Gilleron, M., Prandi, J., Stenger, S., De Libero, G.
EP20070291249, deposited 12/10/2007, extended 13/10/2008. Composition pour la prévention et/ou le traitement des maladies associées à la surexpression du TNF et/ou de l’IL12. Quesniaux, V., Gilleron, M., Puzo, G., Nigou, J.
FR20060010136, deposited 20/11/2006, extended 20/11/2007. Sulfoglycolipid antigens, their process of preparation, and their use against tuberculosis. Puzo, G., Prandi, J., Gilleron, M., De Libero, G., Guiard, J., Mori, L., Paoletti, S. EP20070290097, deposited 24/01/2007, extended 13/10/2008. Sulfoglycolipid antigens, their extraction from Mycobacterium tuberculosis, and their use against tuberculosis. Puzo, G., Gilleron, M., Stenger, S., De Libero, G. EP20030290965, deposited 18/04/2003. Camille Robert (PhD 2017): Research scientist, Evotec, Manchester, UK. Aicha Bah (PhD 2017): Medical science liaison, Terumo BCT, Brussels, Belgium. Jin Wang (PhD 2015): Associate Professor Yancheng University, China. Alexiane Decout (PhD 2015): (1) Research scientist, GLYcoDiag, Orléans, France; (2) Post-doctoral fellow Université Polytechnique Fédérale de Lausanne, Switzerland, since 2017. Landry Blanc (PhD 2014): (1) Post-doctoral fellow Rutgers University, Newark, USA; (2) Post-doctoral fellow CNRS-Université de Bordeaux, France, since 2019. Laure Tonini (PhD 2014): (1) Engineer, CNRS-INSERM-Université de Toulouse; (2) Innovation finance consultant Leyton, Toulouse, France, since 2018. Romain Castanier (PhD 2013): Quality control manager, dairy facility, Aveyron, France. Diane Cala-De Paepe (PhD 2011): Engineer, CNRS-Université de Lyon, France. Emilyne Blattes (PhD 2010): (1) Post-doctoral fellow University of Bern, Switzerland; (2) Medical science liaison, Innovative Medecine for Tuberculosis, Lausanne, Switzerland, since 2016. Aurélie Ray, (PhD 2010): (1) Post-doctoral fellow Trudeau Institute, Saranac Lake, USA; (2) Research scientist, Transgène, Lyon, France, since 2013. Gérald Larrouy-Maumus (PhD 2009): (1) Post-doctoral fellow National Institute for Medical Research, MRC, London, UK; (2) Group leader Imperial College London, UK, since 2014. Chia-Fang Liu (PhD 2008): Miidex, Toulouse, France. Emilie Layre (PhD 2008): (1) Post-doctoral fellow Harvard Medical School, Boston, USA; (2) CNRS research associate, IPBS, Toulouse, France, since 2014. Jolanta Mazurek, 2017: Scientist Selvita, Cracow, Poland. Naila Mebarek, 2016: Assistant Professor Université de Bordeaux, France. Sandro Silva-Gomes, 2016: Research scientist, GSK, Stevenage Herts, UK. Bachir Saadeh, 2015: Sales engineer 10x Genomics, Toulouse, France. Shiv Dubey, 2009: Assistant Professor Govind Ballabh Pant University, Uttarakhand, India. Marlène Cot, 2009: Research scientist CRITT Bio industries, Toulouse, France. Sandrine Bouhet, 2008: Head scientific program coordinator, Europa Group, Toulouse, France. Eliette Darthuy, 2008: AQSE, Toulouse, France. Fabien Riols, 2018: Engineer in metabolomics, University of Munich, Germany. Florence Iehl, 2017: Engineer in biochemistry, Université Paris Sud, France. Laure Ducassé, 2015: Engineer in animal experimentation InvivoGen, Toulouse, France. Bérengère Ferrié, 2015: Technician chemist Evotec, Toulouse, France. Marion Bonhomme, 2015: Technician chemist Adocia, Lyon, France. Anne-Sophie Bardou, 2015: Social supervisor Midi-Pyrénées Expertise, Toulouse, France. Sophie Zuberogoitia, 2015: Engineer biochemist, Enobraq, Toulouse, France; 2019: CNRS Engineer, IPBS, Toulouse, France. Marie Gonzales, 2015: Technician chemist Evotec, Toulouse, France. Delphine Bordignon, 2014: Technician chemist Solvionic, Toulouse, France. Cécile Glénat, 2013: Technician chemist Etienne Lacroix Group, Sainte-Foy-de-Peyrolières, France. Benjamin Gau, 2010: Quality Specialist SGS, Montréal, Canada. Our team is labelled by the Fondation pour la Recherche Médicale (2018-2021). To secure their colonization and survival, pathogens have evolved tactics to undermine host immune responses. Better understanding pathogen invasion strategies is key to develop appropriate preventive or therapeutic tools. Scientists from the team "Immunomodulation by Mycobacterial Lipids and Glycoconjugates" at the Institute of Pharmacology and Structural Biology (IPBS - CNRS/Université Toulouse III - Paul Sabatier) have uncovered a molecular mechanism by which the tuberculosis bacillus escapes detection by the innate immune system. This study is published in the Proceedings of the National Academy of Sciences of the USA, on October 2 2017. Mycobacterium tuberculosis, the causative agent of human tuberculosis, is a bacterial pathogen that has adapted to subvert the function of macrophages, whose one of the roles is to recognize and kill invading microorganisms. In the present study, the scientists used a library of M. tuberculosis mutants to infect macrophages and decipher molecular mechanisms by which the pathogen modulates the function of these immune cells. 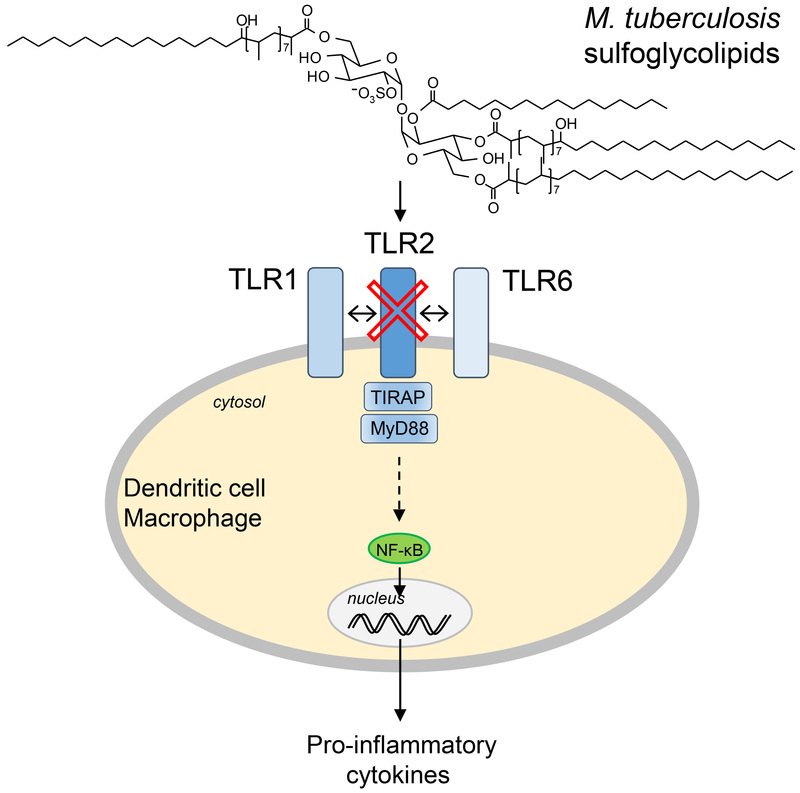 They found that M. tuberculosis produces cell envelope glycolipids that are antagonists of a macrophage receptor, named TLR2, which is dedicated to the recognition of pathogens, thereby preventing its efficient recognition by the immune system. This work was performed in collaboration with the Centre d'Infection et d'Immunité de Lille (CIIL), the Pasteur Institutes from Paris and Korea, and the biotech company InvivoGen (Toulouse). TLR2 is pattern recognition receptor that heterodimerizes with TLR1 or TLR6 to recognize bacterial lipoproteins. It triggers an intracellular signaling pathway that leads to the activation of the transcription factor NF-κB and the production of pro-inflammatory cytokines, required to mount an efficient immune response against invading microorganisms. However, the pathogenic bacterium M. tuberculosis produces surface glycolipids at its cell envelope, named sulfoglycolipids, which are competitive inhibitors of TLR2/TLR1 and TLR2/TLR6 heterodimers. Vaccination is a highly effective method of preventing infectious diseases. However, adjuvants are needed to enhance the immunogenicity of vaccine antigens. For many years, the development of adjuvants has been an empirical process. Scientists from the team "Immunomodulation by Mycobacterial Lipids and Glycoconjugates" at the Institute of Pharmacology and Structural Biology show that new generation adjuvants can be designed on a rational basis. This study is published in the Proceedings of the National Academy of Sciences of the USA, on 21 Feb 2017. Vaccines are mainly used to fight infectious diseases but they can also help to treat cancer. Historically, vaccines have been made with live attenuated or dead pathogens. For many pathogens, however, such vaccines have not been successfully developed. Moreover, they can be associated to side effects. Current efforts aim at the development of subunit vaccines that induce a well-defined immune response against specific antigens, from pathogens (virus, bacteria) as well as from tumors. However, vaccine antigens are often poorly immunogenic and require additional components, termed adjuvants, to help stimulate protective immunity. Most of the adjuvants in use have been developed empirically without a clear understanding of their mechanisms of action. Adjuvants inducing a strong humoral immunity, which protects against extracellular pathogens, are available. But, adjuvants directing the development of robust cellular immune responses, required to fight against intracellular pathogens or tumors, are still needed. Recently, the C-type lectin receptor Mincle was found to elicit such responses on the recognition of microbial glycolipids, thereby providing a basis for the rational design of new adjuvants. In the present study, the scientists used a multidisciplinary approach, combining chemical synthesis, cell biology, and molecular modeling to decipher the molecular bases of ligand recognition by the receptor. This led them to synthesize new compounds inducing stronger immune responses, while being less toxic, than the currently available Mincle ligands, and that represent new powerful adjuvant molecules. This work was performed in collaboration with the biotech company Invivogen (Toulouse), the “Laboratoire d’Ingénierie des Systèmes Biologiques et des Procédés” (Toulouse) and the "Centro Nacional de Investigaciones Cardiovasculares Carlos III (Madrid). Decout, A., Silva-Gomes, S., Drocourt, D., Barbe, S., André, I., Cueto, F.J., Lioux, T., Sancho, D., Pérouzel, E., Vercellone, A., Prandi, J., Gilleron, M., Tiraby, G. & Nigou, J. (2017) Rational design of adjuvants targeting the C-type lectin Mincle. PNAS, doi: 10.1073/pnas.1612421114. May 2013: Mannodendrimers : anti-inflammatory drugs of tomorrow ? Our team is affiliated to the Doctoral School "Biologie - Santé - Biotechnologies de Toulouse" (Ecole doctorale BSB). All team members are strongly involved in teaching to or supervising students from the Master 1 “Biochimie et Biotechnologie” and the Master 2 “Structural and functional biochemistry”. In addition, our team is host for students from the Masters 2 "Molecular Microbiology", "Immunology and Infectious Diseases", and the Erasmus+ Master LIVE (Leading International Vaccinology Education). Alain Vercellone and Emeline Fabre are assistant Professors in Biochemistry of the University Toulouse III - Paul Sabatier (UPS). They teach structural and analytical biochemistry (A.V. ), and protein engineering and glyco-enzymology (E.F.). 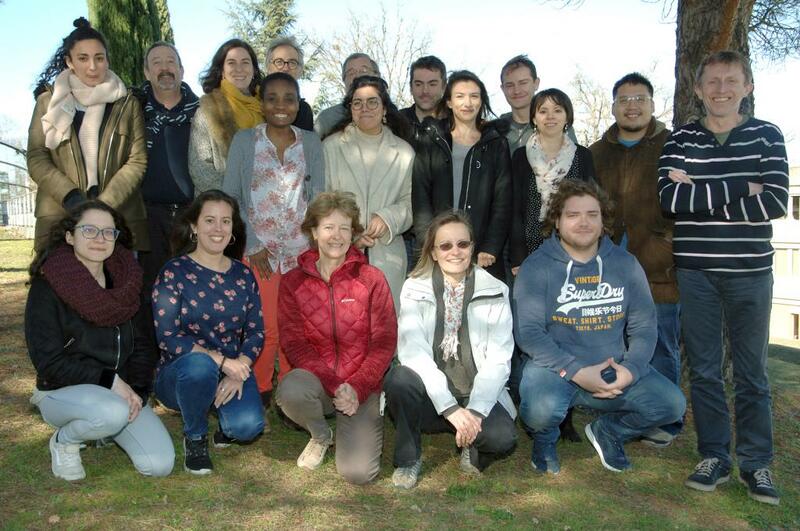 Other team members are involved in teaching at the Master 2 Research “Biologie Structurale & Fonctionnelle”, at the “Licence Professionnelle CAQ - Chimie, Analyse et Qualité” from Institut Universitaire Technologique de chimie de Castres (IUT), and at the Toulouse School of Lipids.